Another good buy for my child. He was very happy about it and so glad I purchased it. My son loves the additional baseball pillow . Perfect size for his twin bed. 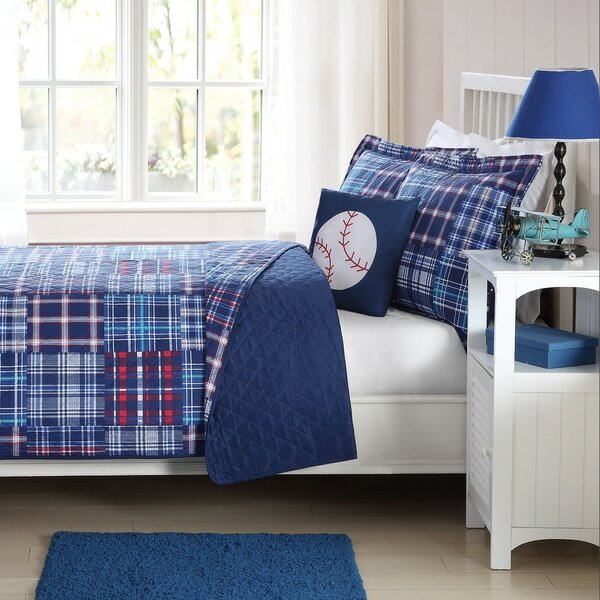 Add a hint of classic style to your kid's bedroom with the navy plaid patch quilt set. This set features a soft microfiber construction with a patchwork plaid pattern in blue and red with a baseball patterned decorative pillow. Lightweight fill and fabric keeps you cool during the warm months, but durable enough to last year round. 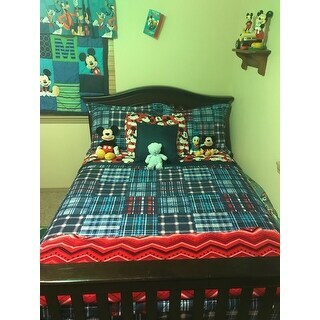 The quilt and sham material is cheap in feel and appearance. Very thin. Not very soft although I have not washed it yet. The baseball pillow is really bad nylon material. It is labeled "Made in China" and the manufacturer in China must think a baseball is shaped closer to an oval than a circle. Disappointed. Will probably return. This quilt set is very vibrant and well made. It is a perfect fit on the full size bed. I am very satisfied and would highly recommended it! Great set for my boys room. Quilt is on thinner side but looks beautiful. Colors are bright and kids love them. Colors have not faded with washing yet. This is a beautiful quilt set that is well made, soft and durable. It looks great in our son's bedroom and we've already received numerous compliments on it. I was a little disappointed with this set. The quilt is super thin and cheap looking. I spent the same amount on a quilt set at *** for my daughter's room and it was such better quality. Looks awesome on boys bunk beds, used baseball pillow for one who loves ball and bought the hero in training pillow to use on the son who loves fire trucks, Great set to grow with. I love this set ... ordered it for my grandson and he really loves it. The colors are true to what is pictured. Great quality! Perfect for my son's bedroom. This is a quilt not a comforter, so it's not as thick, which is exactly what we were looking for. Perfect for a kids room or spare bedroom. The value is great for this item. Thin quilt, but perfect for my hot blooded son. No sports theme on the blanket, which is nice so it can be used longer in life. The pillow is more of a nylon, it is nice and fluffy. Colors great, fits well, and cute! Material was not what I wanted, but may be right for other purposes. The quilt was very plastic feeling and the print was poorly done, looked cheap. It was motel quality, which may be fine if you're looking for linens for your Air BnB, but wasn't what I wanted. My son picked this out for his bunk and I couldn't be happier with the purchase. It's stylish and washes well. Cute bed spread. Great for my little boy!